Friday night was the third session in our ongoing first adventure "The Hunt for Gerulf", played with Castles & Crusades and supported by the techniques in Gamemastering. Today's post is a reflection on the three key things that I have noticed from these games. 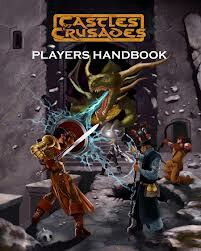 Firstly, our games have been a lot easier to run and much more flowing using Castles & Crusades. I'm not sure that this is because C&C is the "perfect game" or anything so crass, but rather because it is simple enough to become largely invisible. Last session the only times I had to pick up the rules were to check on spell descriptions. This is because I'm the only one with the rules. At the end of the session, the third successful games night in a row, the players voiced the desire to access the rules for themselves - the guy with the Cleric stated that it was time to get the rules so he could learn the spell descriptions. The system wasn't invisible in the first two sessions though. There is a learning curve with any game and there is a need for us to get our heads around the specifics through play. That's ok as long as the learning period is short and doesn't get in the way of the session. I believe the success of C&C for us (so far) has to do with it being familiar to anyone who has played D&D or any d20-system game. The weird thing is that I wasn't entirely sure that I'd enjoy the system. I was positive about C&C because it has an Old School, stripped down, no messing around kind of feel. Yet, as anyone who reads this column knows, I like my detail and complexity. If there's one thing I have learned, however, it's that detail and complexity is only going to work in a game if you can remember it and use it easily. When it comes down to playing games, it's a lot more fun to just roll with a simpler game and enjoy the show. One of the not-so-dirty secrets I've learned of being a good GM is you run what the players want to play, not what you want to run. Seeing my players really engaged and enjoying the relatively simple and classically fantasy D&D-like game makes it really hard to want to do anything other than deliver more of what they want. Brian Jamison's "Gamemastering" is becoming quite an influential book for me. It's not that I agree with everything he has written but more that, as I try out his techniques, I am discovering ways to more effectively engage the group of players. The biggest change in the last two sessions has been my practising of the three modes as GM: camera, actor and judge. Although I am still not confident in actor-mode, pushing my boundaries a little more has been fun to do. I've certainly seen my players rise more to the challenge of playing in-character too - especially after I introduced XP rewards for maintaining it all session. Most influential, however, has been camera-mode. Focusing on what I describe and making sure that description is both detailed and accurate for what the players need has been key. For example, when describing the throne room in our last session it was important to focus the camera on three features: the throne, the Shaman's possessions, and the sign on the exit door. Simply remembering not to add in details that would distract from these key elements was a major boost to the play of the group: the players were able to focus on what was important to the story while not being distracted by unnecessary red-herrings. As Judge I realise that, with a simple system, I have less to do in-game. Most of my decisions relating to rules are being made during prep. Yet prep is becoming less intensive too. For example, when constructing the scene with a phalanx of Legionary Skeletons, it was easy to reference the relevant entry in the Monsters & Treasure book, choosing how I would modify the stats and which item I might choose as a reward. During the game there were far fewer rulings to make because the scene was already thought through and, combined with the simpler system, we found ourselves able to focus on trying to "describe the action" rather than "game the scene". Obstacles are the heart of the game, the fundamental structure that keeps the GM sane and the players motivated. An obstacle is one clearly spelled out challenge. An obstacle must be simple – a locked door that needs to be picked, a foe that needs to be overcome, a message that needs delivering. If you can’t explain the obstacle in such simple terms, then you probably don’t have a single obstacle. Working my way through Chapter 7 once again (it's a chapter I keep coming back to) I realised that this is the most useful tool in Jamison's box. But it's more subtle than I initially realised. To conquer any obstacle, three stages are always involved: Information Gathering, The Challenge, and Celebrating Victory. These stages provide a sort of atomic structure for roleplaying games. This is the thing that has begun to transform my own gaming and, most notably, my prep. In Friday's session, for example, I provided the group with invitations to go in either of two directions in their quest: deeper into the complex via the door with a warning sign, or back out of the complex trailing the escaped Shaman. The next obstacle in the complex was to cross the Black Bridge; the obstacle outside would be to encounter the Shaman again. One player initially wanted to follow the Shaman. The key was in the information they gathered: while the tracks showed clearly where to go to pursue the Shaman, the throne room provided the evidence they needed to decide to go deeper. Either obstacle was an option and I tried to remain calm and let the group decide. The result was all the more satisfying for both them and me because they freely chose. GMing my group is becoming a lot more focused. I know that I've got an Action-orientated group which means that I can't muck around too much with initial set-up: I need to get the game rolling and add details as we go along. Last session I gave each player a small note asking one or two simple questions to clarify something on their character's RP sheet. These were little details that matter to me as GM but probably less so to the players... at least, not right now. For example: "What's the name of the innkeeper friend you mentioned?" I am prepping using the obstacle structure and drawing on the ideas that players have suggested on their character's RP sheet. Remembering to provide information, challenge and a celebration has really improved the quality of my obstacles... and the enjoyment of the game. I am running a simple system that gets out of the way. This means we can focus on becoming better roleplayers. Encouraging in-character interaction has really begun to sparkle: listening to the players discuss, in role, their decisions and ideas is a lot more fun for all. And you know what? I'm enjoying it all a lot more too. Here's to another session and another fun time! This formulae although perhaps a little more complex reminds me of your description of Debs GM'ing a more sci-fi themed roleplay game, where she rolled with what the players wanted/expected picking out their best ideas and making it up as she goes along. I suppose you prep for so long and draw on questions and voiced thoughts the players have made in game to help build the picture for what lies ahead. It feels more natural for everyone because what comes next is not necessarily predictable yet already familiar. Familiarity in good roleplay I believe has to be present, to make the new stuff, more interesting and also to draw us in more. I've found the more alien the environment / setting and story, the more likely we are as players to waste time on those useless red herrings. Although a little misdirection can be fun, it is so only briefly, because of course the players want to make progress and they want to overcome the obstacles before them. Our group's greatest problem at times has been establishing what the obstacle is, or having too many obstacles to choose from. Yeah, Deb was always ahead of me. I guess I caught on eventually, although the process is different to hers. Designing obstacles and prepping how they are presented and celebrated is a major development.